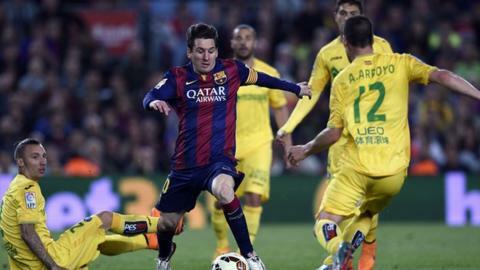 Barcelona's Lionel Messi is "too good" and impossible to stop, according to Bayern Munich coach Pep Guardiola. Guardiola spent four years as Barca manager from 2008, winning three league titles, two Champions Leagues and two Club World Cups. The 44-year-old also played for the club for 11 years between 1990 and 2001. "Barca is a very important part of my life," he added. "Until now it was everything but I am here to win. I am not here for a homage but to see Bayern through to the final." Messi, who will make his 100th European appearance in Wednesday's match, said of Guardiola: "He was with us for a long time and we had the luck to win many titles and experience important moments. He is a coach that studies everything. Messi also Barca had been "hurt" by their 7-0 aggregate defeat by Bayern in the Champions League semi-finals of 2013. "That hurt a lot, but a lot of time has passed," said the Argentina forward. "We come into the game differently, as do they, and it will be a different tie to that one."